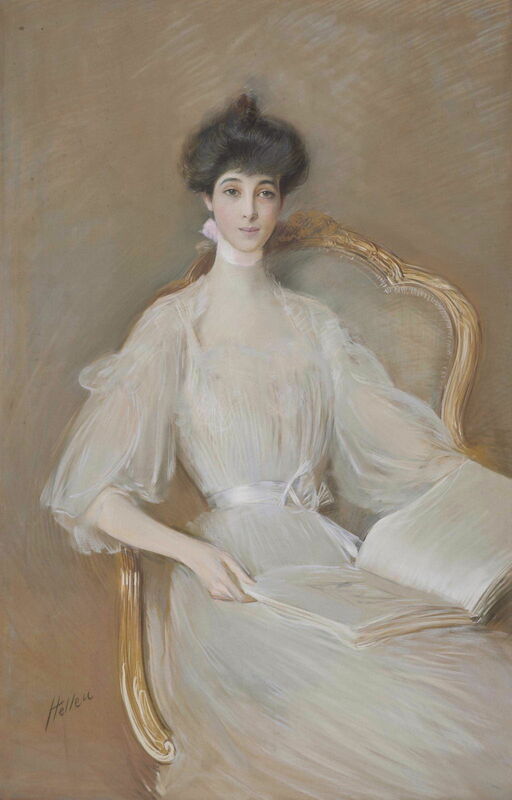 Paul César Helleu (1859–1927), Consuelo Vanderbilt, Duchess of Marlborough (c 1900), pastel on canvas, 144 x 97.5 cm, location not known. Wikimedia Commons. In the eighteenth century, pastel became established as a thoroughly acceptable medium, particularly for portraiture. It was acceptable for women, used by most of the major artists, even if more popular for studies and sketches rather than finished works. Pastels also came to influence oil painting, with their rich colours and lightness. My next pastel star spans the eighteenth and nineteenth centuries, and laid the way for even greater things: Louise Élisabeth Vigée Le Brun (1755–1842). Louise Élisabeth Vigée Le Brun (1755–1842), A Baby (c 1790), pastel, dimensions and location not known. Wikimedia Commons. 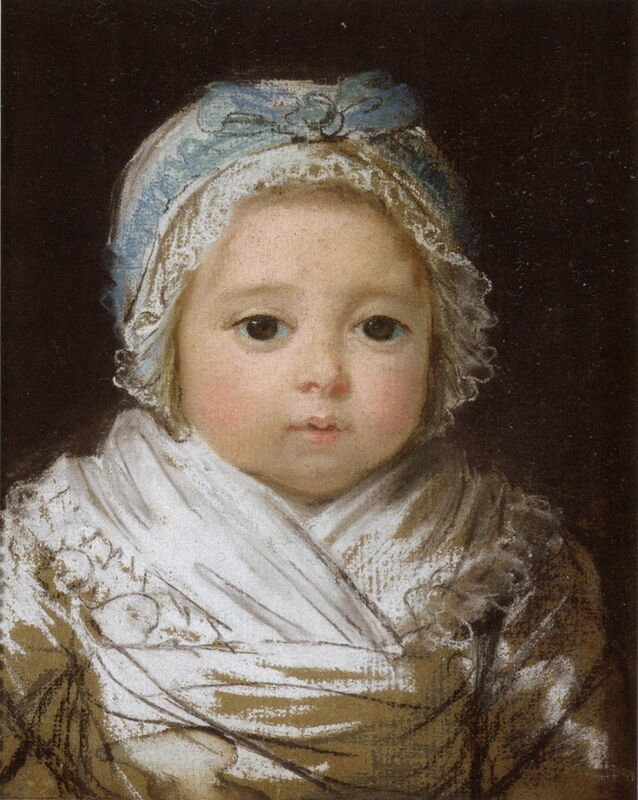 Her simple portrait of a baby from about 1790 takes up from where Carriera and de La Tour had made their marks: this infant’s face is softly rendered, but their clothes are sketched in a loose style which was far in advance of paintings of the day. 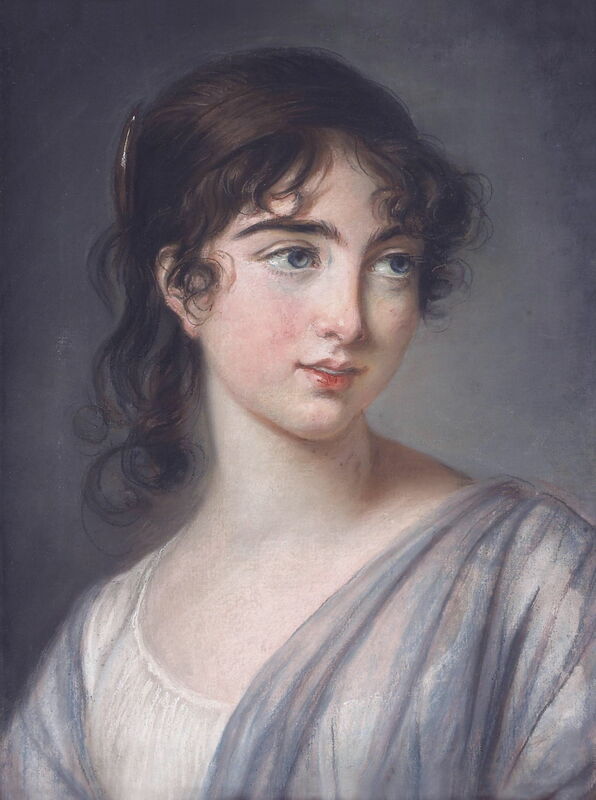 Louise Élisabeth Vigée Le Brun (1755–1842), Corisande Armandine Léonie Sophie de Gramont (1782-1865) (married Charles Augustus, 5th Earl of Tankerville in 1806) (date not known), pastel on paper, 45.8 × 33.6 cm, location not known. Wikimedia Commons. Her portrait of the wonderfully-named Corisande Armandine Léonie Sophie de Gramont has a natural look to it which was rarely achieved in oils. This ideally suited the sitter, given her youth. 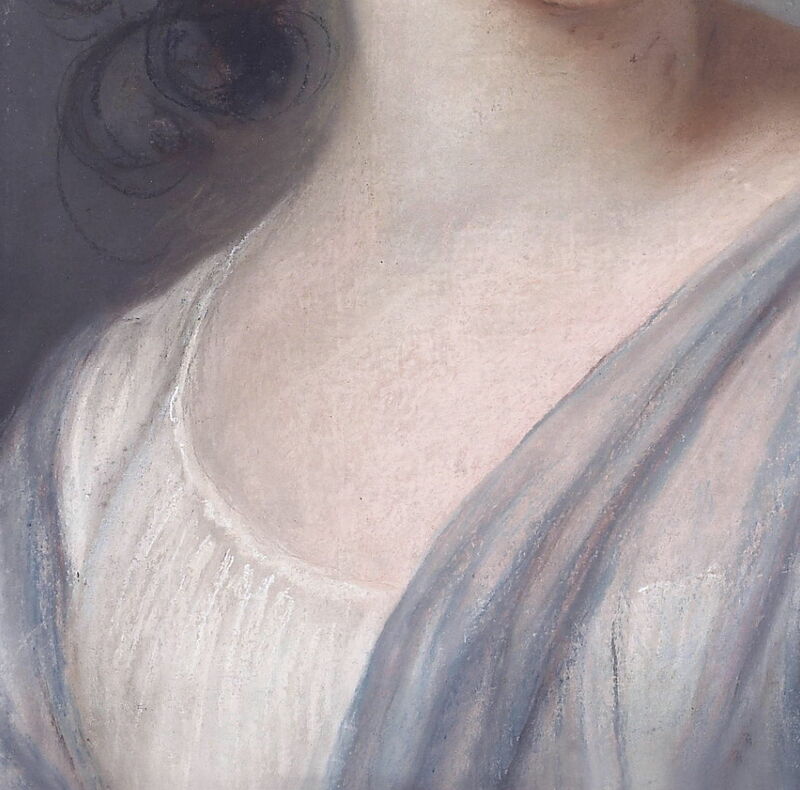 Louise Élisabeth Vigée Le Brun (1755–1842), Corisande Armandine Léonie Sophie de Gramont (1782-1865) (detail) (date not known), pastel on paper, 45.8 × 33.6 cm, location not known. Wikimedia Commons. This detail shows how painterly are the sitter’s clothes. Louise Élisabeth Vigée Le Brun (1755–1842), View of the Lake of Challes and Mont Blanc (1807-08), pastel on blue-green wove paper, two sheets joined, 22.9 × 34 cm, Minneapolis Institute of Art, Minneapolis, MN. Wikimedia Commons. 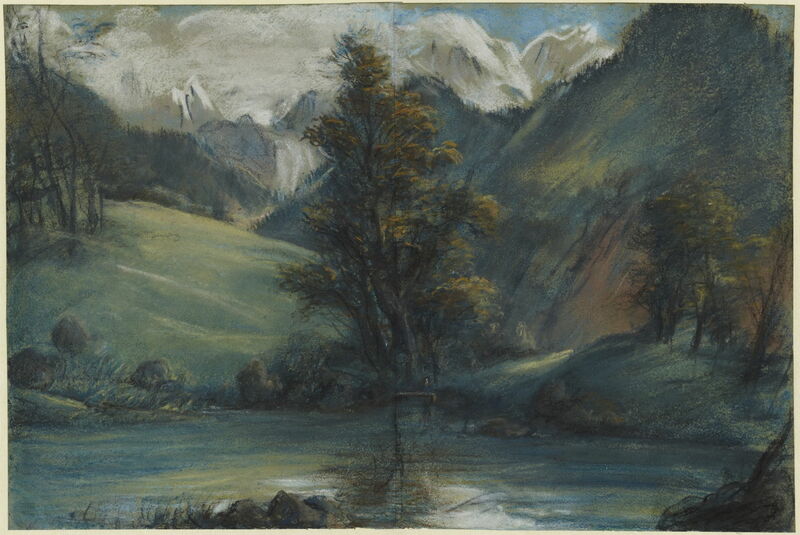 Vigée Le Brun was an early landscape painter in pastels, too: her View of the Lake of Challes and Mont Blanc (1807-08) spread across two sheets of green wove paper, and is perhaps a little dark and forboding, but showed how well-suited pastels are in landscape art. Having spent time painting en plein air with soft pastels in the Alps, I can only agree. Although it may seem a daunting task to carry back large and delicate pastel paintings from this sort of location, they are far easier to handle than a couple of wet canvases. Pastel painting remained very popular through the nineteenth century, but its next major advances came with those around the Impressionists, rather than the core Impressionists, who overwhelmingly preferred oils. 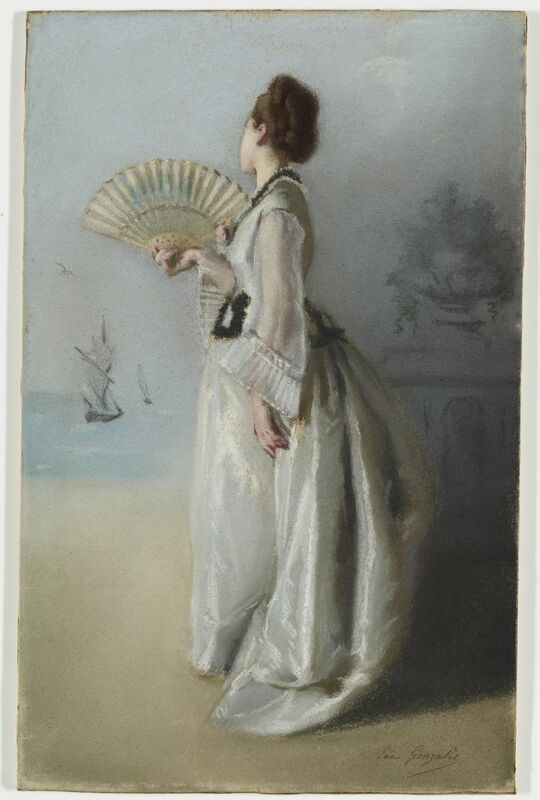 Eva Gonzalès (1849–1883), Lady with a Fan (c 1869-70), pastel on paper affixed to board, 42.5 × 27 cm, Minneapolis Institute of Art, Minneapolis, MN. Wikimedia Commons. Eva Gonzalès (1849–1883), one of the four major women Impressionists, shows the increasing emphasis on marks in her Lady with a Fan (c 1869-70). My next pastel star may surprise you: he is Édouard Manet (1832–1883), who in the last five years of his career painted several exceptional and innovative pastel works. Édouard Manet (1832–1883), Woman Fastening Her Garter (1878-79), pastel on canvas, 55 × 46 cm, Ordrupgaard, Jægersborg Dyrehave, Denmark. Wikimedia Commons. 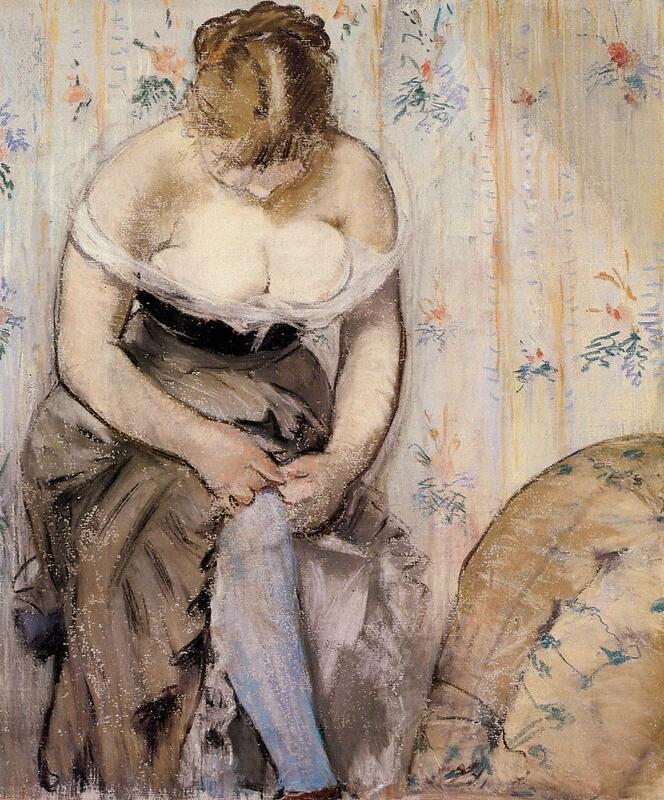 Woman Fastening Her Garter (1878-79) shows a motif which many would associate more with Degas, perhaps, and a style which appears spontaneous and sketchy, indeed thoroughly Impressionist, were it not for its emphasis on form. Édouard Manet (1832–1883), La Toilette (1880-81), pastel on canvas, 55.5 × 46 cm, Private collection. Wikimedia Commons. 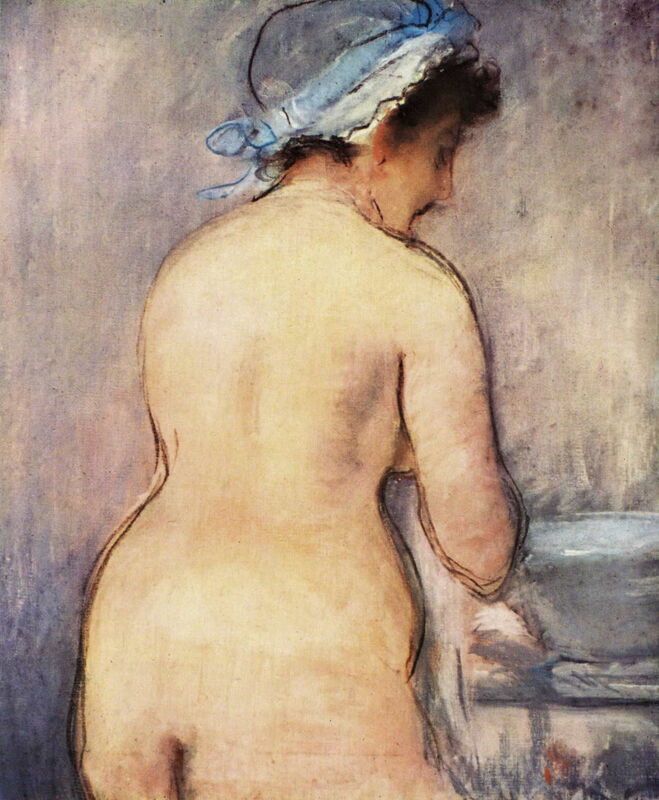 La Toilette (1880-81) looks even more typical of Degas, but Manet has blended in the flesh for smooth tonal transitions. 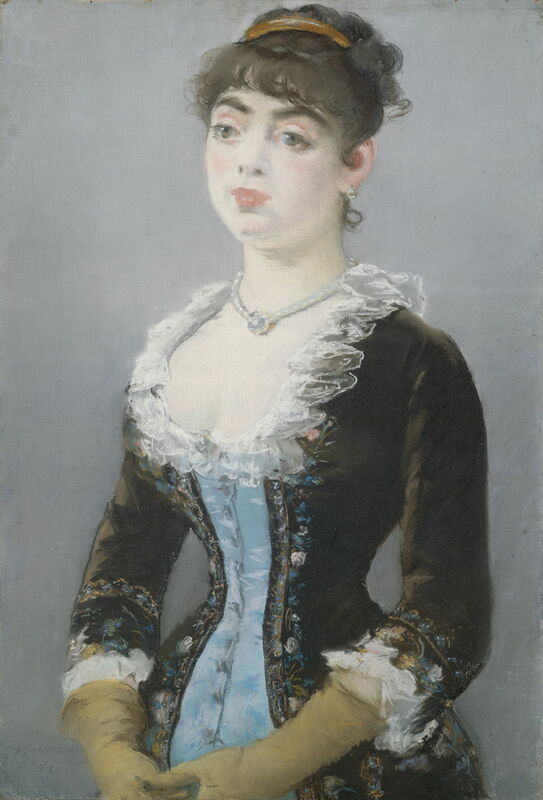 Édouard Manet (1832–1883) Portrait of Madame Michel-Lévy (1882), pastel, 74 × 55 cm, The National Gallery of Art, Washington, DC. Wikimedia Commons. In contrast to those, Manet also painted some beautifully delicate and tender portraits of women, such as this Portrait of Madame Michel-Lévy (1882). John Singer Sargent’s friend Paul César Helleu (1859–1927) was far more radical and exciting in his pastels than he ever was in his other works. This portrait of Consuelo Vanderbilt, Duchess of Marlborough (c 1900) combines perfect, smooth blending over her face with vigorous mark-making through the fabrics and the ornate frame of the chair. 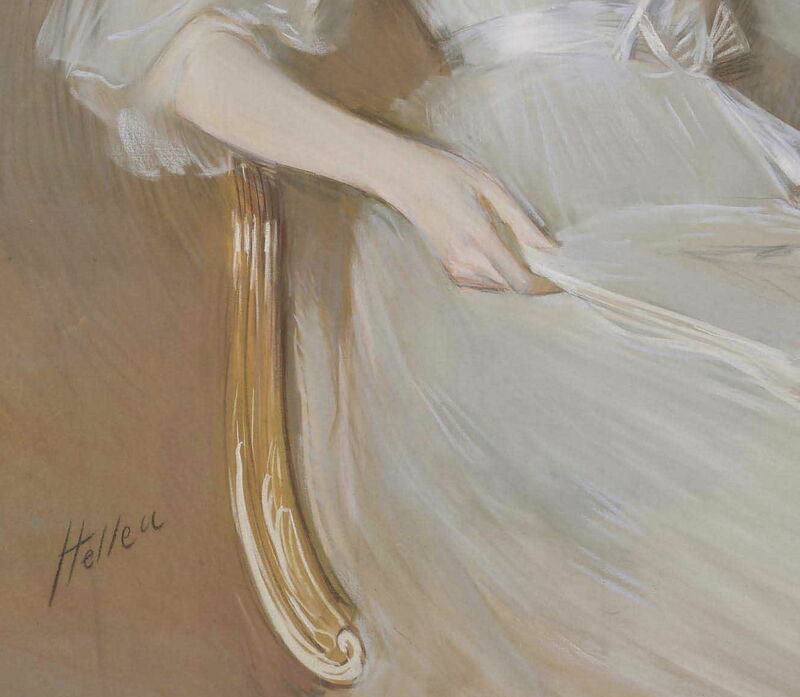 Paul César Helleu (1859–1927), Consuelo Vanderbilt, Duchess of Marlborough (detail) (c 1900), pastel on canvas, 144 x 97.5 cm, location not known. Wikimedia Commons. This is shown well in this detail. 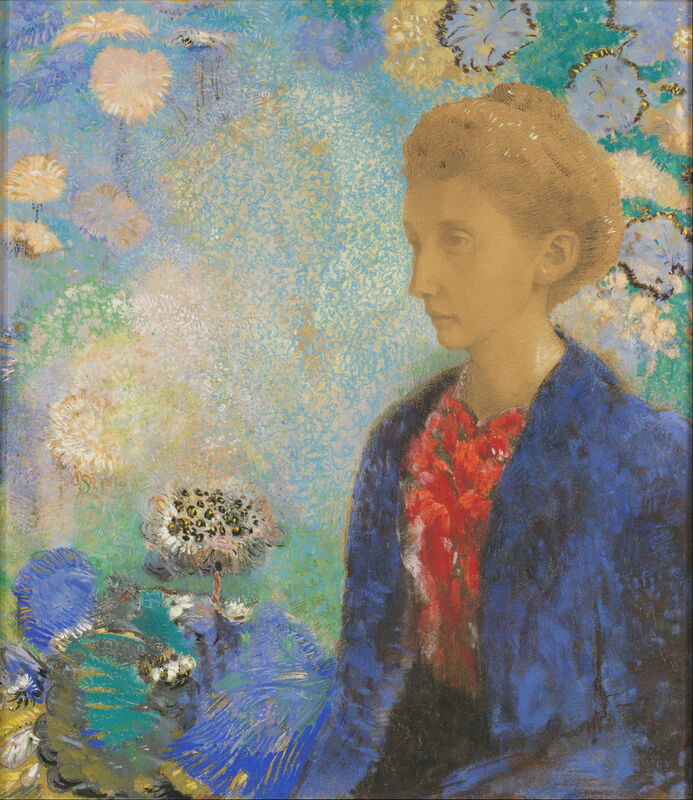 My final pastel star (given that I have already looked at the pastel paintings of Mary Cassatt, and will be examining those of Edgar Degas soon) took the medium on from Degas’ innovation into the twentieth century: Odilon Redon (1840–1916). After all that I wrote about the difference between coloured chalk and pastels, it is ironic that this, one of Redon’s early pastel paintings, includes the use of chalk too. Redon also had the unusual practice of painting some of his portraits in both pastel and oil versions. In those cases, as in this portrait of Baronne de Domecy from about 1900, the pastel painting is far more experimental, here exploring texture and colour, and the relationship between subject and ground. 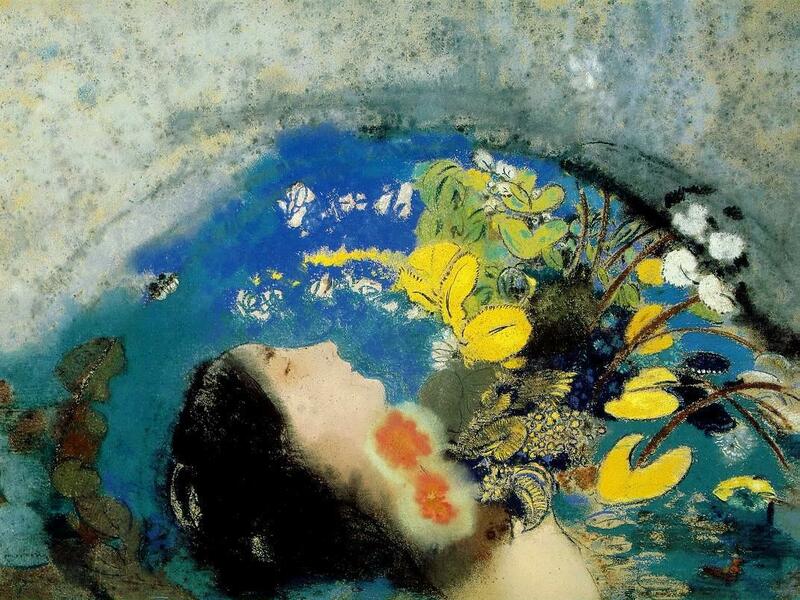 Redon’s depiction of Ophelia’s suicide has an unusual point of view, more than a touch of Japonisme, vibrant colour, and varied forms in the plants. 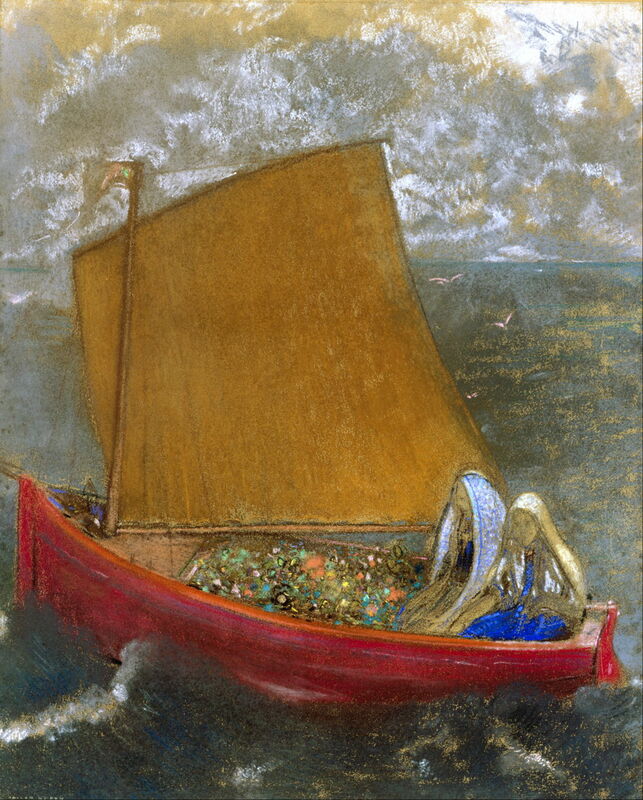 The recurrent theme of a small sailing boat, which kept appearing in Redon’s later paintings, was also most extensive in his pastels. 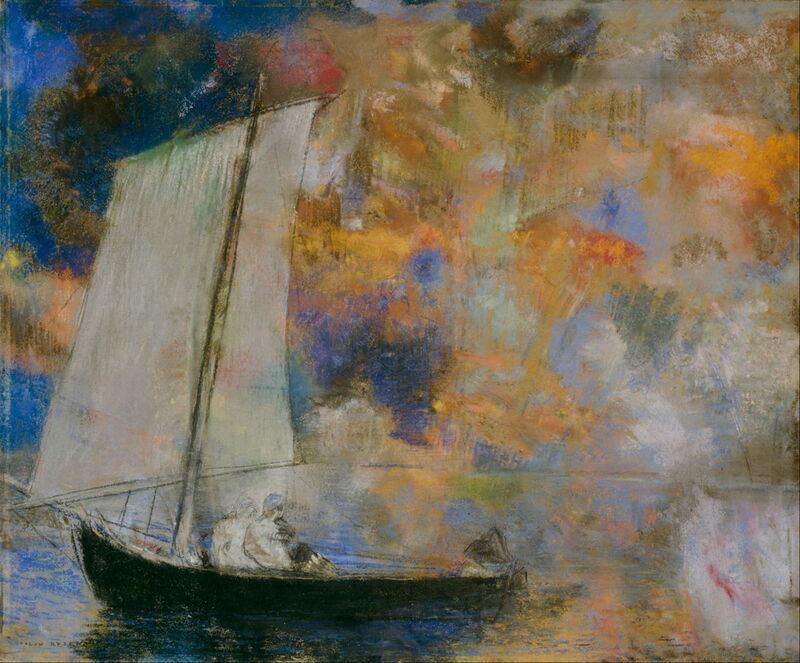 Some, like Flower Clouds (c 1903), above, show the boat sketched in roughly, his paper being dominated by nebulous patches of colour from behind. His best-known painting of the boat, The Yellow Sail (c 1905), below, was painted in pastel too. He exploits new and more intense pigments here, for the sparkling gems in the boat, and the clothing of the two women. Odilon Redon (1840–1916), La Voile jaune (The Yellow Sail) (c 1905), pastel on paper, 58.4 x 47 cm, Indianapolis Museum of Art, Indianapolis, IN. Wikimedia Commons. 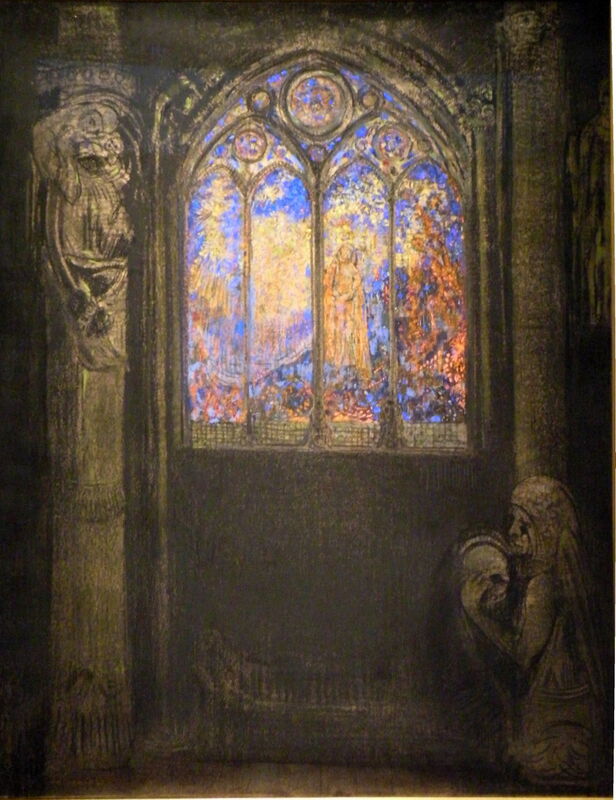 Redon mixed pastels with charcoal to great effect too, such as in his The Large Window. 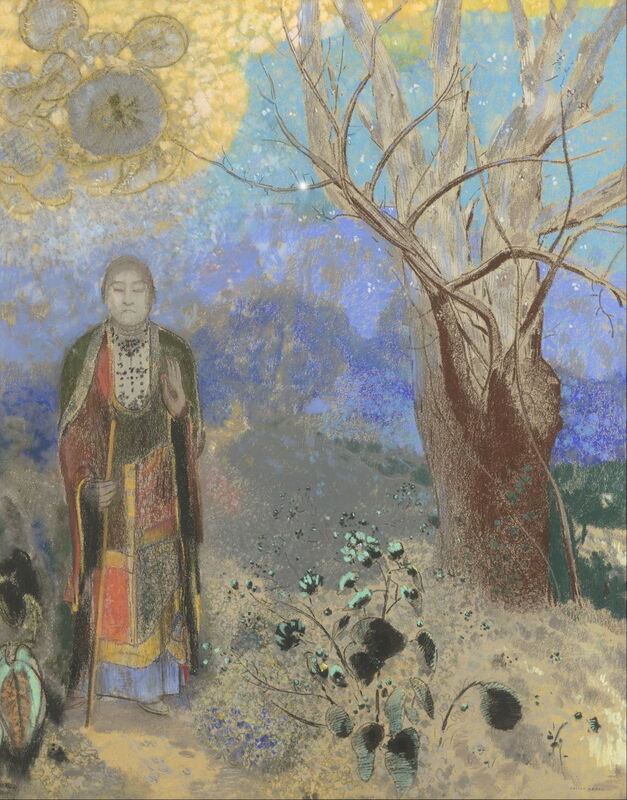 Odilon Redon (1840–1916), Buddha (1906-7), pastel, 90 x 73 cm, Musée d’Orsay, Paris. Wikimedia Commons. Like Degas, Redon used water with his pastels, which may explain some of the wide range of textures and effects in his Buddha (1906-7). Odilon Redon (1840–1916), La coquille (The Seashell) (1912), pastel, 52 x 57.8 cm, Musée d’Orsay, Paris. Wikimedia Commons. 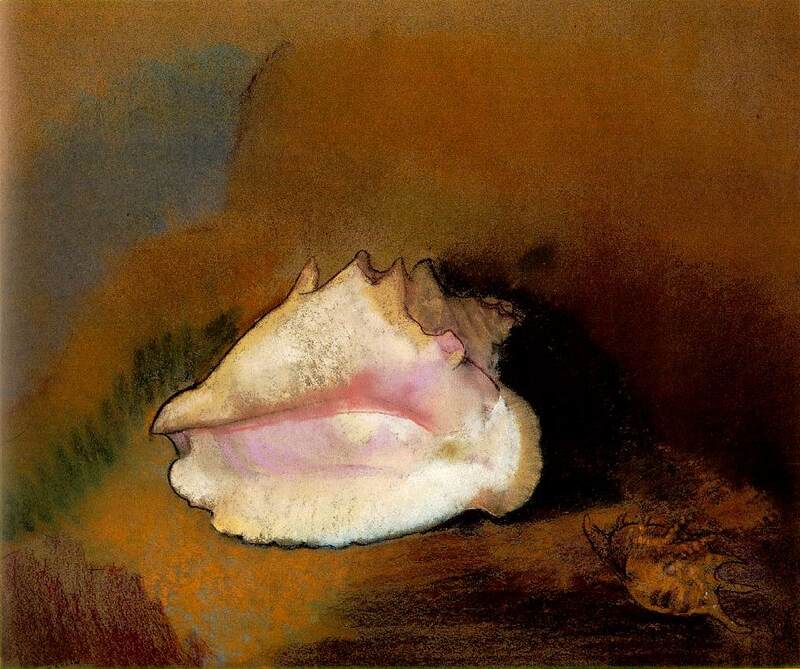 Redon’s late pastel painting of the sea bed, The Seashell (1912), features a wide range of textures and colours, and when seen in real life has a powerful three-dimensional effect in the shell itself. My survey has been a lightning tour through a few of the best pastel painters of their day. I hope that it provides the context within which to view Degas’ many pastels, as well as whets your appetite for them. Posted in General, Painting, Technology and tagged art history, Gonzalès, Helleu, Manet, painting, pastel, Redon, Vigée Le Brun, women in art. Bookmark the permalink. I loved reading this history. I caught it midstream and will go to the previous one too. 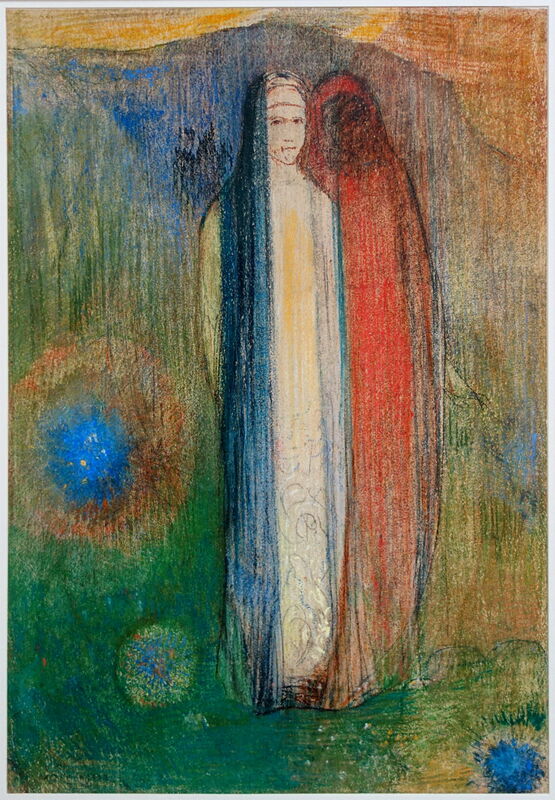 Odilon Redon is one of my favorite artists. But all you’ve featured here are amazing. I’ve worked a bit in pastel and it’s hard to believe what an accomplished artist can do with this soft medium. I have greater success with watercolor than pastel, which view as much harder, although I’ve heard the same said of watercolor. Anyway this was enlightening and so interesting. Thank you. I love watercolour and soft pastel. Some years ago I painted en plein air in soft pastel, in the French Alps. Although I’m not sure that the results were any good, I enjoyed it hugely: they’re just so direct.